I read this book last week. Somehow it slotted itself between two other books I was reading, then wouldn't let me go until the end. For the next few days I'd go to pick up my eReader and then remember I had finished it. I so wanted to read more about these characters. Thank goodness it's the first in a series. I hope you're writing fast, Clarissa! 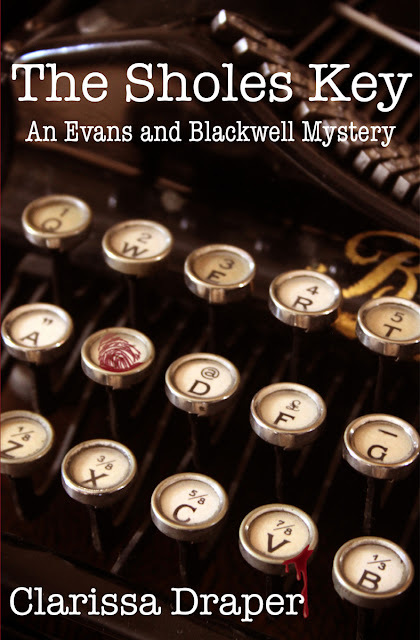 The two main characters: Evans and Blackwell, are a British spook and Detective. And don't you just love the names? They just sound British and coppish - don't they? Anyway they both have intriguing back stories which pop up through the story. Just enough to keep you interested. Against this back drop there are single mothers going missing in London, a good dollop of cryptography, a murderer and an undercover job that just may be going belly up. I liked that there were essentially two unconnected mysteries and, if you're inclined, there's a code to decipher as well. Clarrisa Draper blogs here and you can buy The Sholes Key on Amazon here. Thank you so much. I've completed book two and hope to get it out soon--edits always take time. I have book three all planned and can't wait to start writing it. I'm so glad you enjoyed it. The best part for me in Sholes Key was Blackwell’s sidekick, who appears sporadically, yet consistently, and made me laugh. I enjoyed the banter between them. The cover design is great! Yes, he was good wasn't he?